We all have noise in our images and getting rid of the noise is key to a nice, high-impact image. Nebulosity 2 packages a very powerful tool called GREYCstoration. It’s very powerful, but it’s also got a number of parameters that can vary. 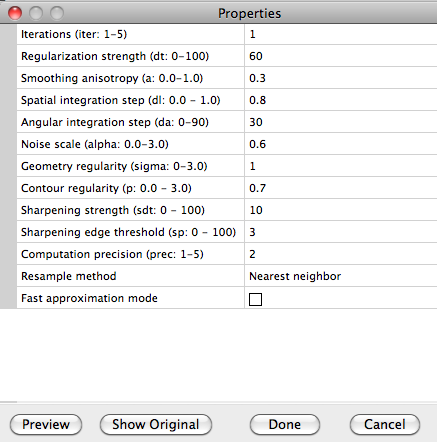 Unlike most tools in Nebulosity, you get little guidance in how to use it and the parameter set isn’t reduced to a few key sliders. That’s meant that many users have skipped past this. They’ve missed a real opportunity, however. It’s one of the best de-noising techniques out there. Before you start a noise-reduction run, make a selection that has some stars, some bright bits (galaxy arms, bits of nebula, etc) and some background. Keep it fairly small, as you’re going to do a lot of iterations of things as you dial in your settings. 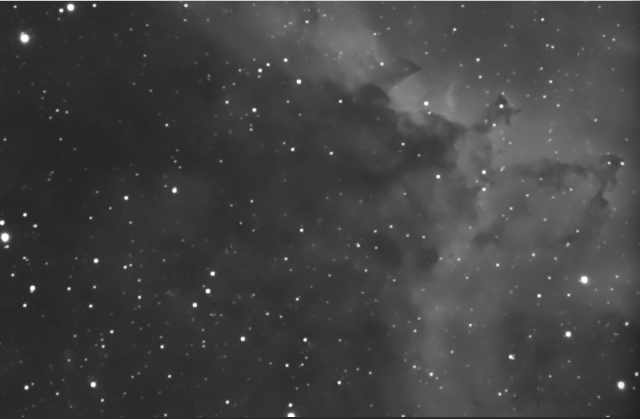 Here is some data from the Heart Nebula (H-alpha). You can download a 540k FITS file with just this region if you like. We’ve got some nice data in here, but after a bit of stretching, the noise is starting to come through. When you start GREYCstoration (Image menu), you get this control panel. So, what to do? There are three parameters to hone in first here. We’re going to work on “regularization strength” (which controls the average amount of smoothness), “noise scale” (how fine/coarse is the noise), and “contour regularity” (which refers to the preservation of structures and contours). Since we’re a bit strong overall, here, let’s dial the regularization strength down to 20 from its default value. We’re better for sure, but still too much is going on. Those wispy bits of nebula are getting hit too hard. Let’s tell GREYCstoration to preserve the contours a bit more. Here, I upped the “contour regularity” parameter to 1.2 through a bit of trial and error. I’m not aiming for perfection yet -- just to start dialing things in. 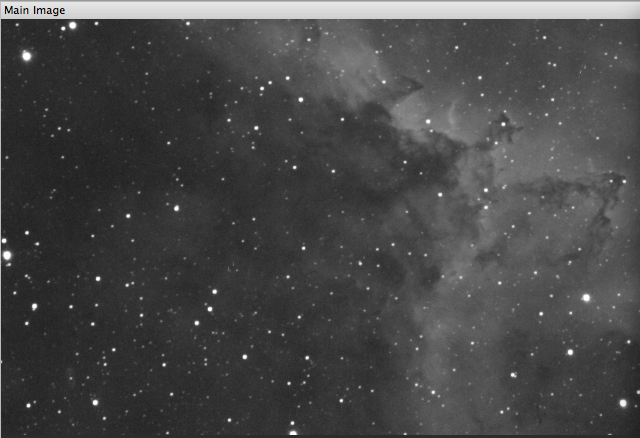 That’s done a nice job at keeping the nebula bits sharp, but I think we’ve gone too far and have started to loose some of the noise reduction there in the darker bits. 0.1 here was a bit too much of a drop. I find on my camera, 0.2 - 0.3 works nicely. So, let’s bring this back to 0.2. At this point, things are looking very good. You can hit Done now, but I like to do two more things before I’m done. 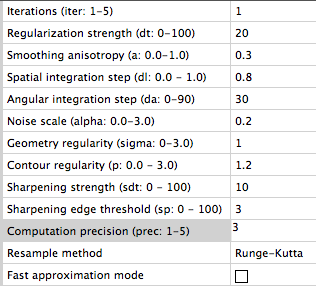 I set the “computation precision” up to 3 and change the resample method to “Runge-Kutta” for a bit higher quality output. Now, have a look at this animation between the original and the final noise reduction version. We’ve taken out the noise in the background there but the stars and nebula have remained sharp. In the end, we came down to these settings. As you try dialing things in for your images, give a shot to these parameters first. Work on a small area and work gradually until you hone in on the right settings. The settings you come up with for one shot will likely be very close to what you’ll want for others. As a final note, keep the History window in Nebulosity open. You’ll see all the versions of the parameters you’ve tried (and remember to hit return or click out of a parameter once you change it). Good luck!